This is our second longest holiday on St Cuthbert’s Way, giving a pretty relaxed pace, once the first day of 15 miles is out of the way. The walk starts in the historic market town of Melrose, and soon climbs steeply up the distinctive twin peaks of the Eldon Hills, giving great views over the Tweed Valley and surrounding border countryside. The route descends through the village of Bowden then on to the ruins of Dryburgh Abbey, sited on a meander in the River Tweed, and site of Sir Walter Scott’s grave. From here it’s a short walk to St Boswells. A pleasant days walking through the rolling countryside of the Borders. The route follows the banks of the River Tweed for a while before heading off along the ancient Roman Road of Dere Street to the village of Harestanes, on the River Teviot. Jedburgh, an historic market town lies 2 miles south, where the 12th Century Abbey is well worth a visit. The route briefly returns to the roman road before taking to an intricate network of paths and tracks through rolling farmland en route for the small village of Morebattle. On the way you will pass the ruined Cessford Castle, built in the 15th century by the Ker Clan. A short day with plenty of ascent and descent, as the route meanders through the foothills of the Cheviot Hills. After crossing Kale Water (rivers are often referred to as ‘Waters’ in Scotland) there is a steep climb up Wideopen Hill, with excellent views in all directions. The route descends to Kirk Yetholm via the banks of Bowmont Water. This is an easier day across moorland, agricultural land, and woodland. 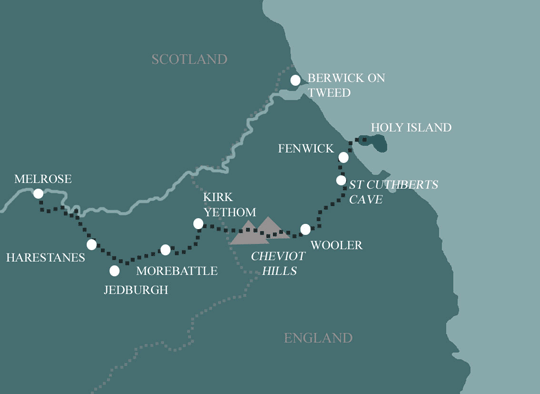 The route visits St Cuthbert’s Cave, an impressive sandstone cave where the monk’s body was hidden from the Vikings. There are great views along the coastline, including the famous Bamburgh Castle, as well as Lindisfarne itself. This is a short, flat day, across the tidal causeway to Holy Island. The causeway is under water for 5 hours at high tide so you need to consult the tide tables. This is a unique walk as the causeway crosses the sands, with the ruined Lindisfarne Abbey and castle growing ever closer. A fitting end to a memorable walk!